With a precise understanding of the relevant industry, we introduce ourselves as the leading manufacturer, exporter and supplier of precision-designed Pin Bush Coupling that is used for the transmission of torque through tensile steel bolts to the machine input. Our provided coupling is manufactured using high grade raw material and the latest technology by our skilled professionals. 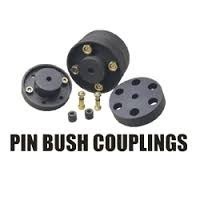 Moreover, provided coupling is delivered after checking it properly against various quality parameters. Capacity: OD 3" to 36"